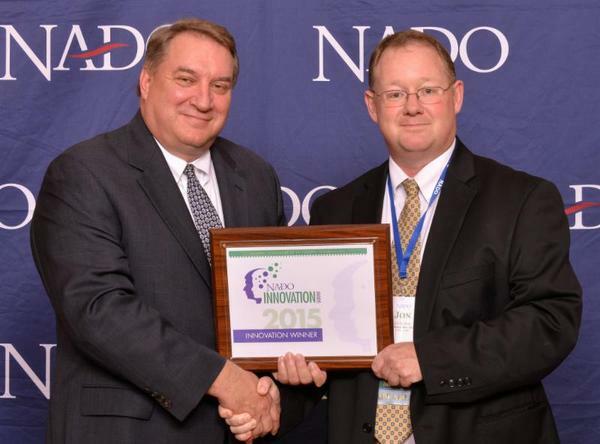 NADO 2014-2015 Board President Terry Bobrowski, right, presents Jon Gulliver of NMDC with a 2015 NADO Innovation Award for the Northern Maine Forest Products Industry Cluster. WASHINGTON, DC - The Northern Maine Development Commission (NMDC) received a 2015 Innovation Award from the National Association of Development Organizations (NADO) Research Foundation for the Northern Maine Forest Products Industry Cluster. The cluster, organized by the Aroostook Partnership and supported by NMDC through grants from the Maine Technology Institute and USDA Rural Development, explores opportunities and challenges in the industry in order to develop actionable items to maximize the growth potential for this key sector in Aroostook's economy. "The Partnership is very proud of the Forest Cluster effort which was a direct outcome of the Mobilize Northern Maine asset-based process," stated Bob Dorsey, the Partnership President. "It is a perfect example of the private sector leadership working in collaboration with education and the public sector who secured grants for the advancement of this critical economic sector in Aroostook County." NADO is a Washington, DC-based association that promotes programs and policies that strengthen local governments, communities, and economies through regional cooperation, program delivery, and comprehensive strategies. The association's Innovation Awards program recognizes regional development organizations and partnering organizations for improving the economic and community competitiveness of our nation's regions and local communities. Award-winning projects were honored during NADO's 2015 Annual Training Conference, held October 24-27 in New Orleans, LA. "For nearly 30 years, NADO's Innovation Award has provided regional development organizations the opportunity to be recognized for their hard work and dedication to promoting economic development in rural and small metropolitan communities across the country. Building on the unique strengths and challenges of each region and community, award recipients continue to promote sustainable economic growth not only now, but for many years to come. And I am pleased to announce that this year over 100 regional development organizations were selected to receive NADO's 2015 Innovation Award," said NADO 2014-2015 Board President Terry Bobrowski, Executive Director of the East Tennessee Development District in Alcoa, TN. For more information about the award-winning project, contact Jon Gulliver at Northern Maine Development Commission at (207) 498-8736. CARIBOU - Companies in Aroostook County looking to expand their business with federal, state and local contracts are urged to attend a free informational session in Caribou Wednesday, December 9. Maine Procurement Technical Assistance Center (PTAC) counselor Dana Delano of Northern Maine Development Commission (NMDC) will explain how to explore resources available to your business when developing a marketing strategy for government contracting opportunities. "Finding marketing opportunities can be a bit intimidating to business owners looking to expand their market with government entities," said Delano. "This workshop will explore the many resources available to assist businesses in finding past and present opportunities and who your competition may be for these opportunities." "From cleaning services, to all types of construction, and even snow plowing; local, state and federal governments are a big consumer of products and services," added Delano. "We want to assist local companies in obtaining these opportunities in order to grow their business." 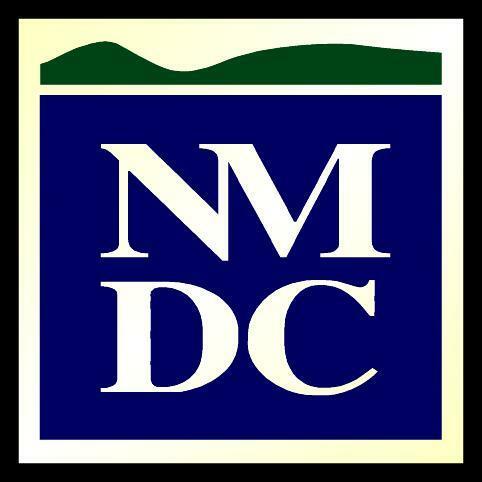 The seminar, sponsored by NMDC, will be from 8:30 a.m. - 10 a.m., Wednesday, December 9 at Northern Maine Development Commission, 11 West Presque Isle Road in Caribou. To register, contact Dana Delano at ddelano@nmdc.org or by calling 521-5840. The Leapfrog Group has named Cary Medical Center to its annual list of Top Hospitals. This coveted and respected recognition showcases the hospital's commitment to Leapfrog's vision of providing the safest, highest quality health care for consumers and purchasers alike. "It is an honor for us to accept this most prestigious award", said Kris Doody, RN and Chief Executive Officer at Cary Medical Center. "It is a tribute to our physicians, mid-level providers, our nursing and clinical staff as well as to all of our support departments. Working as a team we have built a culture of patient and family centered care that has just become a way of life for this organization." Cary's CEO was in Washington D.C. on Wednesday, December 2nd to accept the award at the 15th Annual Leapfrog Meeting. The selection is based on the results of The Leapfrog Group's annual hospital survey, which measures hospitals' performance on patient safety and quality, focusing on three critical areas of hospital care: how patients fare, resource use and management structures established to prevent errors. Performance across many areas of hospital care is considered in establishing the qualifications for the award, including survival rates for high-risk procedures and a hospital's ability to prevent medication errors. Cary Medical Center is one of the original investors in the Partnership, established in 2004.